Everyone loves Legos! There’s something about those brightly-colored interlocking plastic rectangles that opens up the door of creativity. 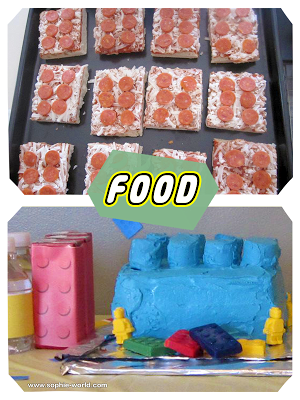 Here is a plan for a party that will bring out the creativity in all of your guests. 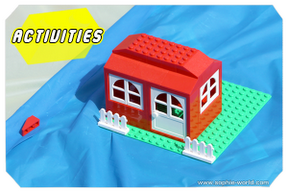 I’ve based my Lego-inspired party on the original blocks, which come in bright, primary colors. Taking that as your cue, use lots of reds, blues, yellows, and greens to decorate your party area. It can be as simple as using paper goods in solid mix-and-match hues, or adding balloons and streamers in those same colors. There are amazing things to be found on Etsy as well, from wrappers that make your water bottles look like little Lego heads, to edible candy bricks, decorated banners, invitations, and goodie bag tags. As guests arrive, have them decorate a paper bag with markers and stickers. This will be an important project, because you’ll need it for the first activity. Once the majority of your guests have arrived, send them on the hunt. You’ll need a large area for this, and lots n’ lots of Legos in every size and color. It’s best if you can set this up in an area separate from the party area, so it can be a complete surprise. Place Legos everywhere (and I mean everywhere!) so that guests have to run around the entire space to fill their bags. You may want to keep a few hundred back, just in case you get someone who arrives late, or doesn’t have great gathering skills. Gather everyone and their Legos in the party space. 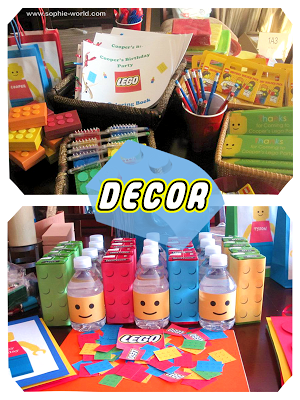 Make sure that each person has their own area; you may want to hand out small bins or trays for the guests so they can dump out their Legos without any getting lost. Tell everyone that they must build the tallest structure they can, set a timer for 5 minutes, and let the challenge begin! After the 5 minutes are up, tell them to join the person sitting next to them on their right (or whoever else is closest). As a team, they must now construct something you’d see in a city using the item they’ve already built as-is, plus their combined Legos. Set the timer again for 5 minutes. When that 5 minutes is up, have each pair join up with another pair, for a total of four team members. This time they have five minutes to build a bridge, using what they already have. You can keep going until everyone’s working together -- the goal here is teamwork and building with Legos! Once you’ve finished the lego challenge it’s time to dismantle. Set a timer and challenge the guest to see how quickly they can dismantle their constructions and run the pieces to the center of the room, where you should have a big open bin. Break the kids into four equal teams, and have each team sit in a corner of the room. Place your large box of Legos (which you used in the previous activity!) in the center of the room. (If you don’t have a big enough box, place a hula hoop on the ground and dump the bricks out in the center of the hoop.) Number each team member, so that one child is “1,” the next is “2,” and so on. Designate a game leader (it could be the birthday child, or an adult) to yell out instructions and keep track of who has already been called. Once you’re set, have the leader yell out a number (which corresponds to a team member) and then a type of Lego. For example, they could yell out, “Number ones, yellow Legos with six studs!” The “1” from each team then runs to the box full of Legos, and searches for a yellow six-studded brick. (“Stud” is the official term for the bumps on Legos -- make sure the kids know that ahead of time, so they don’t look at you like you’re from Mars when you call them that!) Once the player has found the right brick, they run back to their team’s corner and sit down. The first team to get their player back and seated wins a point. Play continues in this way, although after the first Lego, all other Legos must be connected to the previous Legos before the player can sit down and claim a point! Keep playing for as long as you like. This game takes a bit of preparation ahead of time. 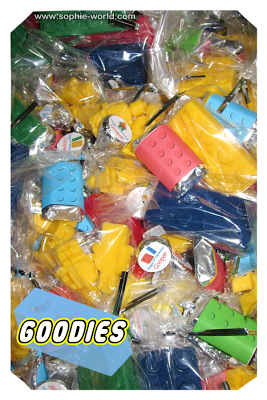 Using our treat balloon technique, place small, square Legos (either the 2 or 4-stud size) into primary-colored balloons, and fill with air. Make sure you use only a limited range of colors for your Legos, like only red, yellow, and blue. Also be sure to have a good mix of colors, because the different colors will make a difference later in the game! Place all the balloons in a big box or bag that is accessible to everyone. Divide your group into teams and line them up on one side of the room, one behind the other. Place a chair for each team on the opposite side of the room. 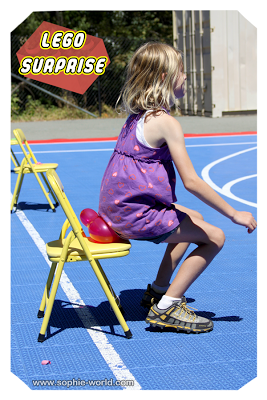 On “Go!” have the first person race over to the box or bag, grab a balloon, run to their chair, and sit on the balloon until they pop it. Once it pops, they must retrieve their Lego piece and race back to their team to tag the next player in line. Play continues until all the balloons are gone. Once play is over, have the teams count up their Legos and award points for the different colors they have. For example, you could say that they get 1 point for every red brick, 2 for every yellow, and 5 for every blue. Add up all the points to determine your winner. Another great idea is the Lego Carnival! 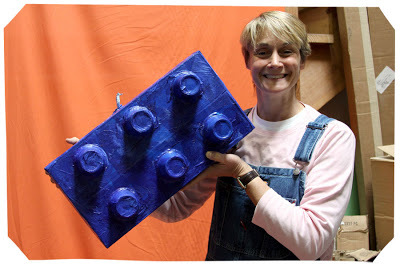 Turn standard carnival games into a Lego-fied ones by building pieces out of Legos. Make sure that you do this in a location where nothing can get broken! Make 3 “pins” out of Legos. Line them up one next to the other, with space in between them. Use rolled up socks as the ball. Each person gets two rolls to see if they can knock down all three pins. 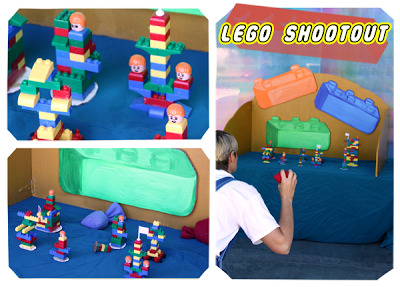 Make Lego targets and place them on a table; use Nerf guns, rolled-up socks, or Frisbees to try and knock the targets off the table. Place a series of buckets or bowls in a line (front to back, headed away from the player). Stand back about 10 feet and try to toss the Legos into each of the bowls. Give players the same number of Legos as there are bowls. The object is to try and get one in each of the bowls, although not necessarily in order! Make an archway out of Legos. Make a few “pucks” out of bricks (or just use small base plates). Stand a few feet back and try to slide the puck through the archway. Mini pizzas with strategically-placed pepperoni! Send your kids home with a little sack of Legos or a small kit from Lego: that way they can continue the great fun for as long as they like! Once your guests have had their fill of Lego activities, it’s time for the piñata. I like to make my own although I do suggest that you score your piñata ahead of time (cut tiny slit marks around the base cardboard box) to make it easier to whack open. This is a simple one! There's nothing easier to make than a rectangular cake! All you need to do is bake a few extra cupcakes, cut off the tops, and use the "stems" as the "studs" on a Lego brick!